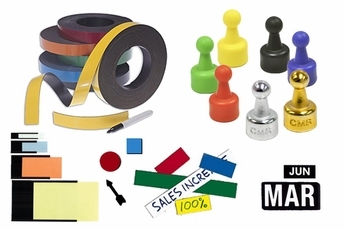 What better to go with a new magnetic whiteboard than some handy magnetic accessories? The following collection of magnets a great compliment to the use of a dry erase board. Depending on what you use your dry erase board for your will find that using the right accessories will add flexibility and ease of use to your day-to-day tasks. 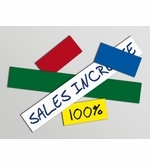 Choose from a selection of magnetic calendar accessories, paper data card holders, super strong mini magnets, magnetic indicators, damp erase magnets and more. Super Strong 3/4" tall. Sold individually. Nine colors to select from. 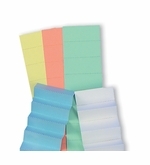 Colored write-on, wipe-off magnets in convenient packs of 25. 10 Colors and 8 widths to select from. From "Available Sizes" "3-1: 3/8\" Tall x 1\" Wide 25/Pkg (+$7.35)" "3-2: 3/8\" Tall x 2\" Wide 25/Pkg (+$8.15)" "3-3: 3/8\" Tall x 3\" Wide 25/Pkg (+$9.70)" "3-4: 3/8\" Tall x 4\" Wide 25/Pkg (+$10.75)" "3-5: 3/8\" Tall x 5\" Wide 25/Pkg (+$12.60)" "3-6: 3/8\" Tall x 6\" Wide 25/Pkg (+$13.95)" "" "4-1: 1/2\" Tall x 1\" Wide 25/Pkg (+$7.60)" "4-2: 1/2\" Tall x 2\" Wide 25/Pkg (+$8.40)" "4-3: 1/2\" Tall x 3\" Wide 25/Pkg (+$9.35)" "4-4: 1/2\" Tall x 4\" Wide 25/Pkg (+$12.00)" "4-5: 1/2\" Tall x 5\" Wide 25/Pkg (+$12.70)" "4-6: 1/2\" Tall x 6\" Wide 25/Pkg (+$16.00)" "" "5-1: 5/8\" Tall x 1\" Wide 25/Pkg (+$5.50)" "5-2: 5/8\" Tall x 2\" Wide 25/Pkg (+$8.15)" "5-3: 5/8\" Tall x 3\" Wide 25/Pkg (+$11.00)" "5-4: 5/8\" Tall x 4\" Wide 25/Pkg (+$14.00)" "5-5: 5/8\" Tall x 5\" Wide 25/Pkg (+$15.95)" "5-6: 5/8\" Tall x 6\" Wide 25/Pkg (+$18.25)" "" "6-1: 3/4\" Tall x 1\" Wide 25/Pkg (+$6.25)" "6-2: 3/4\" Tall x 2\" Wide 25/Pkg (+$8.40)" "6-3: 3/4\" Tall x 3\" Wide 25/Pkg (+$11.25)" "6-4: 3/4\" Tall x 4\" Wide 25/Pkg (+$14.50)" "6-5: 3/4\" Tall x 5\" Wide 25/Pkg (+$18.50)" "6-6: 3/4\" Tall x 6\" Wide 25/Pkg (+$20.75)" "" "7-1: 7/8\" Tall x 1\" Wide 25/Pkg (+$6.55)" "7-2: 7/8\" Tall x 2\" Wide 25/Pkg (+$9.50)" "7-3: 7/8\" Tall x 3\" Wide 25/Pkg (+$12.50)" "7-4: 7/8\" Tall x 4\" Wide 25/Pkg (+$16.25)" "7-5: 7/8\" Tall x 5\" Wide 25/Pkg (+$19.50)" "7-6: 7/8\" Tall x 6\" Wide 25/Pkg (+$24.95)" "" "8-1: 1\" Tall x 1\" Wide 25/Pkg (+$6.80)" "8-2: 1\" Tall x 2\" Wide 25/Pkg (+$11.00)" "8-3: 1\" Tall x 3\" Wide 25/Pkg (+$13.65)" "8-4: 1\" Tall x 4\" Wide 25/Pkg (+$17.25)" "8-5: 1\" Tall x 5\" Wide 25/Pkg (+$19.95)" "8-6: 1\" Tall x 6\" Wide 25/Pkg (+$24.00)" "" "16-1: 2\" Tall x 1\" Wide 25/Pkg (+$11.15)" "16-2: 2\" Tall x 2\" Wide 25/Pkg (+$14.95)" "16-3: 2\" Tall x 3\" Wide 25/Pkg (+$21.50)" "16-4: 2\" Tall x 4\" Wide 25/Pkg (+$26.95)" "16-5: 2\" Tall x 5\" Wide 25/Pkg (+$32.95)" "16-6: 2\" Tall x 6\" Wide 25/Pkg (+$39.95)" "" "24-1: 3\" Tall x 1\" Wide 25/Pkg (+$11.50)" "24-2: 3\" Tall x 2\" Wide 25/Pkg (+$19.75)" "24-3: 3\" Tall x 3\" Wide 25/Pkg (+$27.95)" "24-4: 3\" Tall x 4\" Wide 25/Pkg (+$36.95)" "24-5: 3\" Tall x 5\" Wide 25/Pkg (+$44.95)" "24-6: 3\" Tall x 6\" Wide 25/Pkg (+$54.00)" "Select Color" "W: White" "Y: Yellow" "R: Red" "BL: Blue" "G: Green" "BK: Black" "O: Orange"
Colored write-on, wipe-off magnets in bulk packs of 100 for larger jobs. 10 Colors, 4 widths & 5 lengths to select from. From "Available Sizes" "4-2B: 1/2\" Tall x 2\" Wide 100/Pk (+$23.00)" "4-3B: 1/2\" Tall x 3\" Wide 100/Pk (+$32.00)" "4-4B: 1/2\" Tall x 4\" Wide 100/Pk (+$41.00)" "4-5B: 1/2\" Tall x 5\" Wide 100/Pk (+$50.00)" "4-6B: 1/2\" Tall x 6\" Wide 100/Pk (+$59.00)" "" "6-2B: 3/4\" Tall x 2\" Wide 100/Pk (+$29.00)" "6-3B: 3/4\" Tall x 3\" Wide 100/Pk (+$41.00)" "6-4B: 3/4\" Tall x 4\" Wide 100/Pk (+$53.00)" "6-5B: 3/4\" Tall x 5\" Wide 100/Pk (+$65.00)" "6-6B: 3/4\" Tall x 6\" Wide 100/Pk (+$77.00)" "" "8-2B: 1\" Tall x 2\" Wide 100/Pk (+$31.00)" "8-3B: 1\" Tall x 3\" Wide 100/Pk (+$44.50)" "8-4B: 1\" Tall x 4\" Wide 100/Pk (+$57.00)" "8-5B: 1\" Tall x 5\" Wide 100/Pk (+$70.50)" "8-6B: 1\" Tall x 6\" Wide 100/Pk (+$83.00)" "" "16-2: 2\" Tall x 2\" Wide 100/Pk (+$55.00)" "16-3: 2\" Tall x 3\" Wide 100/Pk (+$80.00)" "16-4: 2\" Tall x 4\" Wide 100/Pk (+$105.00)" "16-5: 2\" Tall x 5\" Wide 100/Pk (+$130.00)" "16-6: 2\" Tall x 6\" Wide 100/Pk (+$155.00)" "Select Color" "W: White" "Y: Yellow" "R: Red" "BL: Blue" "G: Green" "BK: Black" "O: Orange"
Printed calendar date sets in numbers 1 to 31, same as the days in a month. One set equals one month. 1" tall flat printed months of the year. Jan through Dec. Select from three color schemes. 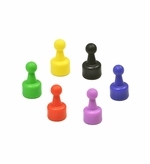 1" tall x 2" wide magnetic days of the week abbreviated. 4 colors available. From "Options" "125-01: 1/2\" x 1\" 25/Pack (+$7.75)" "125-02: 1/2\" x 2\" 25/Pack (+$8.50)" "125-03: 1/2\" x 3\" 25/Pack (+$10.00)" "125-04: 1/2\" x 4\" 25/Pack (+$11.50)" "125-06: 1/2\" x 6\" 10/Pack (+$9.45)" "125-12: 1/2\" x 12\" 10/Pack (+$14.95)" "" "1275-01: 3/4\" x 1\" 25/Pack (+$8.85)" "1275-02: 3/4\" x 2\" 25/Pack (+$9.25)" "1275-03: 3/4\" x 3\" 25/Pack (+$10.95)" "1275-04: 3/4\" x 4\" 25/Pack (+$12.80)" "1275-06: 3/4\" x 6\" 10/Pack (+$8.75)" "1275-12: 3/4\" x 12\" 10/Pack (+$16.00)" "" "012-01: 1\" x 1\" 25/Pack (+$8.95)" "012-02: 1\" x 2\" 25/Pack (+$10.75)" "012-03: 1\" x 3\" 25/Pack (+$12.50)" "012-04: 1\" x 4\" 25/Pack (+$14.50)" "012-06: 1\" x 6\" 10/Pack (+$9.95)" "012-12: 1\" x 12\" 10/Pack (+$19.50)" "" "20-02: 1 3/4\" x 2\" 25/Pack (+$12.00)" "20-03: 1 3/4\" x 3\" 10/Pack (+$12.00)" "20-04: 1 3/4\" x 4\" 25/Pack (+$23.75)" "20-06: 1 3/4\" x 6\" 10/Pack (+$16.00)" "20-12: 1 3/4\" x 12\" 10/Pack (+$29.95)" "" "02-3: 2\" x 3\" 10/Pack (+$16.95)" "02-6: 2\" x 6\" 10/Pack (+$19.95)" "" "03-05: 3\" x 5\" 10/Pack (+$13.00)" "03-12: 3\" x 12\" 10/Pack (+$26.95)"
Colored Data Card Inserts for the Magnetic Data Card Holders which are sold separately. From "Available Sizes" "10-1: 3/8\" x 1\" 1000/Pk (+$6.50)" "10-2: 3/8\" x 2\" 1000/Pk (+$11.00)" "10-3: 3/8\" x 3\" 1000/Pk (+$13.50)" "10-4: 3/8\" x 4\" 1000/Pk (+$19.00)" "10-6: 3/8\" x 6\" 1000/Pk (+$26.00)" "" "15-1: 11/16\" x 1\" 1000/Pk (+$6.50)" "15-2: 11/16\" x 2\" 1000/Pk (+$11.00)" "15-3: 11/16\" x 3\" 1000/Pk (+$17.00)" "15-4: 11/16\" x 4\" 1000/Pk (+$20.50)" "15-6: 11/16\" x 6\" 1000/Pk (+$39.00)" "" "20-1: 13/16\" x 1\" 1000/Pk (+$7.00)" "20-2: 13/16\" x 2\" 1000/Pk (+$11.95)" "20-3: 13/16\" x 3\" 1000/Pk (+$18.00)" "20-4: 13/16\" x 4\" 1000/Pk (+$22.00)" "20-6: 13/16\" x 6\" 1000/Pk (+$29.00)" "" "30-2: 1 5/8\" x 2\" 1000/Pk (+$19.00)" "30-4: 1 5/8\" x 4\" 1000/Pk (+$40.00)" "" "40-2: 1 7/8\" x 2\" 1000/Pack (+$23.00)" "40-3: 1 7/8\" x 3\" 1000/Pack (+$40.00)" "40-4: 1 7/8\" x 4\" 1000/Pack (+$46.00)" "Select Color" "W: White" "B: Blue" "Y: Yellow" "L: Lime" "S: Salmon" "M: Mixed-Equal Amounts"